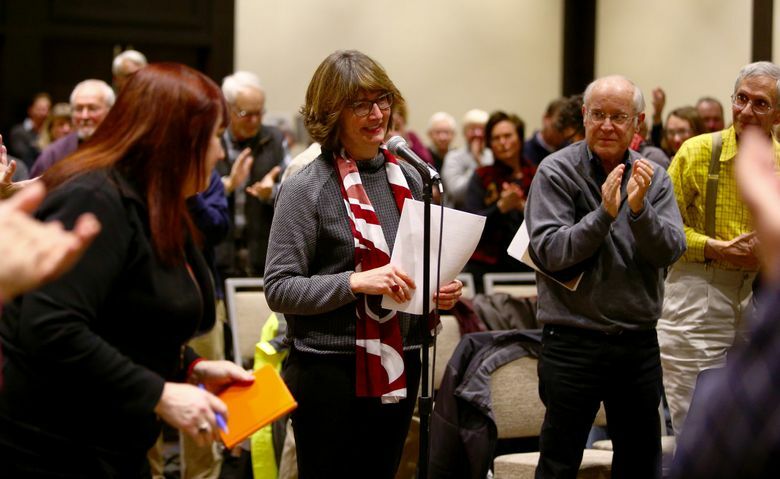 During an emotional meeting at the Westin Hotel, KPLU listeners applauded the advisory board for pushing back against PLU’s plan to divest the radio station. An emotional crowd of around 200 people clapped and cheered on Monday afternoon as members of the KPLU advisory board voted unanimously to oppose the sale of the radio station to KUOW. Longtime KPLU listener Lan Mosher described the transaction as “a kick in the teeth” to the local media landscape. Another longtime listener, Dahl Kim, from Tacoma, said she prefers KPLU’s “more in-depth news coverage” to KUOW’s. Before the vote, KPLU council president Stephen Tan reminded the crowd, which was packed into a conference room at the Westin Hotel in Seattle, that “we need to recognize our limited authority as an advisory council,” which doesn’t have the power to scuttle the deal. But he led the council in a vote to send a letter to PLU in the next day or two expressing consternation about the sale. Both KPLU and KUOW are public-radio stations, and both are owned by universities: Pacific Lutheran University in Tacoma and the University of Washington in Seattle, respectively. At a Nov. 12 meeting, the UW Board of Regents announced its intent to buy KPLU for $7 million and $1 million in underwriting — which took KPLU’s staff and listenership by surprise, in part because KPLU had recently finished a successful fall fundraising drive. Afterward, KUOW President Caryn Mathes said the current plan is to move all the news coverage to KUOW and turn KPLU (which has a split format of news and music) into a full-time jazz and blues station. PLU has also approved the deal, though it won’t become formal until December and then must be approved by the Federal Communications Commission. KPLU currently employs 36 people. PLU spokeswoman Donna Gibbs says roughly a third of them work on the news side and that they can apply for jobs at KUOW, though there are no guarantees or firm numbers on how many positions might become available. According to a March email from PLU President Tom Krise, which was obtained by The Seattle Times, enrollment was expected to fall by 100 students in fall of 2015 and around 40 full-time faculty and staff positions were being eliminated. At the Monday meeting, KPLU general manager Joey Cohn said the station is as financially strong as it’s ever been, and a forthcoming audit of its past fiscal year will show it as $389,000 in the black. Nobody who spoke at the meeting was happy about the transaction. During a public-comment period, some listeners compared the station to the Seattle Post-Intelligencer, Pike Place Market, the Sonics and other local institutions that have either been threatened or disappeared over the years. Others suggested KPLU be run as an independent nonprofit, like KEXP or WNYC. KPLU news director Erin Hennessey choked up when talking about the station’s recent accomplishments under the leadership of Cohn which, she said, are “something to be damn proud of.” The crowd responded with a standing ovation. The show of support was heartening to some KPLU staffers.